NEW BRUNSWICK, NJ.-Currently on view at the Zimmerli Art Museum at Rutgers University are exhibitions by two major artists who worked in the Soviet Union in the decades before the fall of Communism, Vladimir Nemukhin and Boris Sveshnikov. The exhibitions derive entirely from the museums 20,000-piece Norton and Nancy Dodge Collection of Soviet Nonconformist Art, the largest and most comprehensive collection of Soviet dissident art from the historical Cold War period between 1956 and 1986. Vladimir Nemukhin: Works on Paper runs through March 27, 2011 and Embodied Dreams: The Later Work of Boris Sveshnikov is open until April 10, 2011. Vladimir Nemukhin is a leader of the generation that initiated the unofficial art movement in the Soviet Union in the late 1950s and 1960s. Unofficial artists such as Nemukhin rejected the official doctrine of Socialist Realism, the art style based on Communist collective propaganda and the only method permitted in the Soviet Union at the time. Instead these artists proclaimed an individual and independent approach to art that was concerned with universal values. Nemukhin developed a predominately abstract and highly personal style, often incorporating playing cards, a readily distinguishable hallmark of the artist. 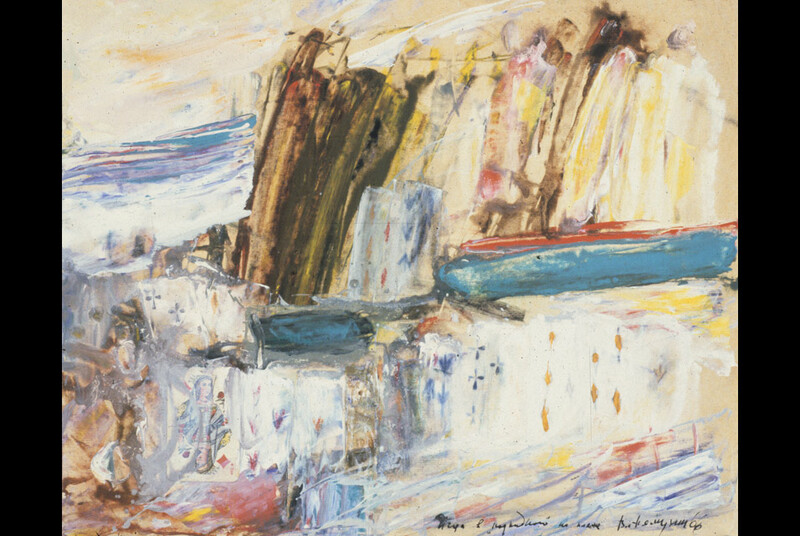 The exhibition presents a unique opportunity to explore the graphic work of Nemukhin, which offers a more intimate perspective on his artistic development. In the late 1950s, when the political liberalization initiated by Nikita Khrushchev led to a slightly relaxed cultural climate, Nemukhin was among the first to search for an individual style without ideological bias and restrictions. In the 1960s and 1970s Nemukhin was prominent among the significant personalities in the Moscow art world who, through their art and fearless attitude, made Moscow underground art internationally known despite incessant pressure applied by censorship authorities. He acted as a skillful negotiator between unofficial artists and the state and provided unselfish assistance and moral support to many fellow artists. Today Nemukhin is considered a living classic of Soviet nonconformist and Russian contemporary art. His works are part of major public collections in Russia, Europe, and the United States. In 2008 Nemukhin became an honorary member of the Russian Academy of Arts. He lives and works in Moscow. Embodied Dreams: The Later Work of Boris Sveshnikov is the second installment of a two-part retrospective of the artists paintings and drawings. While the first part of this exhibition presented works created during the artists internment, this current installment centers on the art produced by Sveshnikov after his release and subsequent rehabilitation. Focusing on the images done after his return to Moscow, from 1963 until his death in 1998, this exhibition follows the artist as he searches for meaning in the incomprehensible, creating a new style of representation that mirrors the dislocation of dreams, explains Allison Leigh-Perlman, Dodge-Lawrence Fellow at the Zimmerli and curator of the exhibition. At the age of nineteen, Sveshnikov was falsely accused of subversive activity while studying as an art student in Moscow. Denied a fair trial and sentenced to eight years of hard labor in the Siberian Gulag, Sveshnikovs life became, like that of millions of other innocent Soviet citizens, a lesson in perseverance and survival despite disturbing inhumanity. Following his release, Sveshnikov was employed as a book illustrator, but continued to explore the style of fantastic realism he had developed during his incarceration. Marked by a sense of indeterminacy and suspension, these works demonstrate in their sheer shock of color and dissolution of form the persistence of traumatic memory.